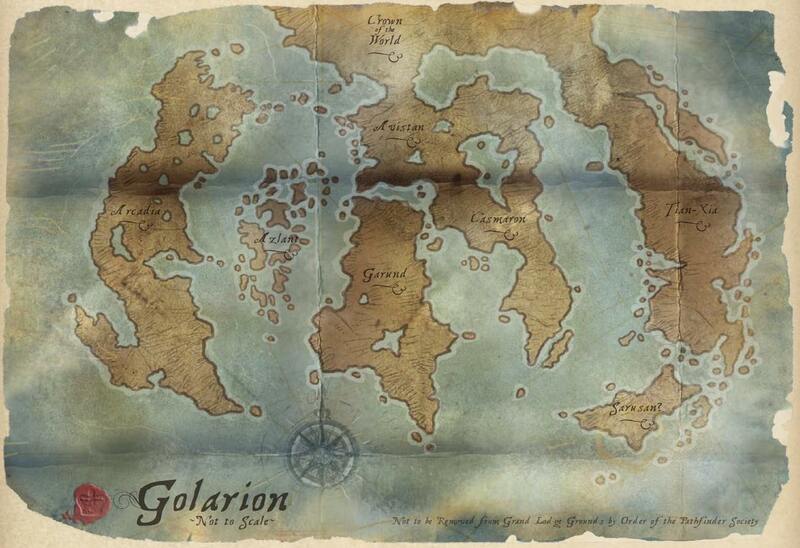 I was looking around on the Paizo site and apparently there’s a full world map of Golarion in the new Campaign Setting, and they have an image of it posted! That’ll come in handy for me as the PCs in my Reavers campaign get a ship and head out on the high seas for some piracy. I love Golarion – I was a long time Greyhawk devotee, favoring it over the Forgotten Realms and other settings (I’d experiment with the others, but always returned to GH) but Golarion has supplanted that for me – it’s a fun, deep, brilliant world that both grounds you but also is easy for a DM to make their own. This entry was posted in talk and tagged D&D, golarion, Pathfinder, RPG, RPGs. Bookmark the permalink. I could not agree more about Golarion. I too am a huge Greyhawk fan. Most of the campaigns in which I played a character were most always set in Forgotten Realms, but when I was DM, I stuck with Greyhawk as it was not too overdone with supplements and sourcebooks. Allowed for morer creative freedom. So far I really like the Golarion setting and Ernest really makes it his own with our Reavers campaign. I am not buying much source material so I can keep player knowledge at a minimum and be as surprised and excited as my character (Tommy) when new events unfold.